Living in rural New South Wales with her mother and sisters. eleven-year-old Lou's life is turned upside down when her father walks out on her mother. Feeling abandoned, she copes by building a tough outer shell but blames her mother and refuses to let her get close. Life becomes more interesting when her estranged grandfather (Doyle) moves in to the family home. Doyle brings chaos with him, not least because he is ill and confused. In this state, Doyle mistakes his granddaughter for his long departed wife, showering her with attention in an attempt to win her affections. Lou, intrigued, plays along with the fantasy. As the game progresses, Lou begins to experience genuine care from Doyle. Her tough shell begins to be chipped away to build a friendship – in the most unexpected of circumstances. Lou is, by all accounts, an involving and emotional second feature from Australia filmmaker Belinda Chayko, director of the 2000 City Loops (released abroad as the dopily titled Bored Olives) that features a remarkable debut performance from Lily Bell-Tindley in the title role, and a typically fine turn from John Hurt as grandfather Doyle. 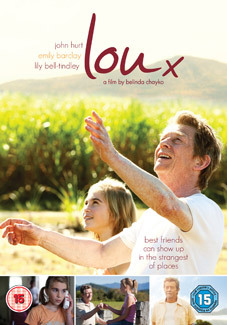 Lou will be released on UK DVD on 8th August 2011 by Matchbox Films at the RRP of £15.99.